Steinberg Architects, Gensler, and developer Shenzhen Hazens Real Estate Group have released a new batch of renderings depicting a slew of design changes for their $700 million L.A. City Center project, a two-tower luxury development planned for Downtown Los Angeles that was recently approved by L.A.’s City Planning Commission. The new renderings depict the latest iteration of a continually-changing project that has morphed from a three-tower complex into one containing only two spires. Previous schemes showed a collection of 32-, 34-, and 38-story towers clustered over an eight-story parking podium. 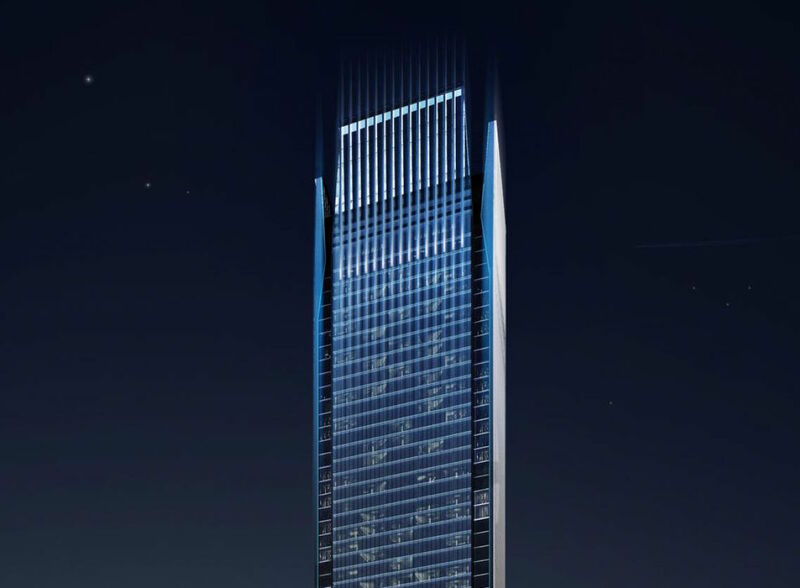 The new images depict a pair of towers, one 29 stories tall, the other rising 49 floors. 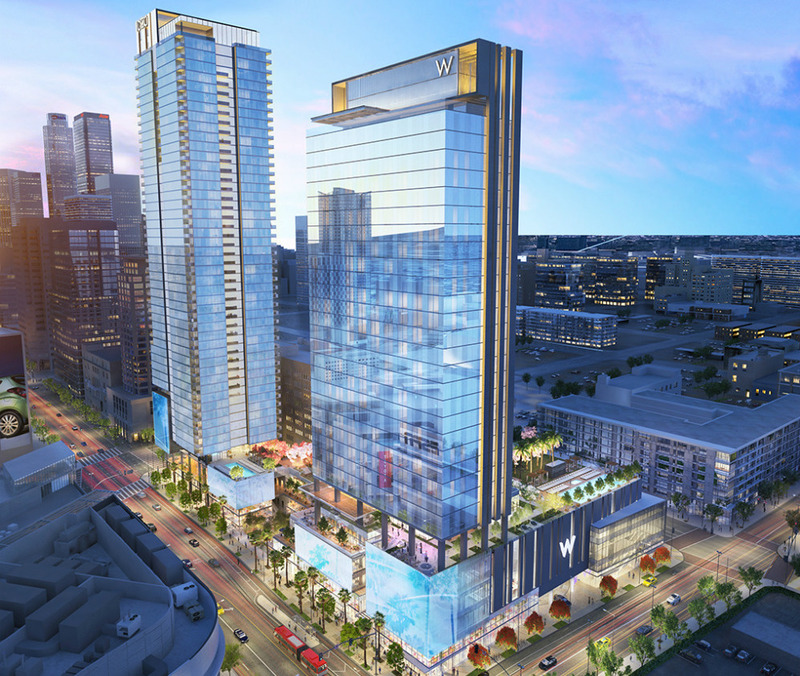 The 29-story tower, which sits on the southern corner of the site, will contain a 300-key hotel operated by W Hotels and will be designed by Gensler. The 49-story edifice, designed by Steinberg, will contain 435 condominium units. The scheme has also jettisoned the parking podium connecting the towers. Parking will now be located underground and a shorter podium structure filled with hotel public amenities, commercial spaces, and a hotel spa will ground the towers instead. Like several other developments in the quickly-changing area, the L.A. City Center’s base will be wrapped with massive LED displays. Both towers have grown significantly more conservative in their massing and articulation throughout the design review process. Gone are the towers’ soaring pitched roofs, angled articulated massing, and vertically-oriented patterning. Instead, the towers now feature minimally-broken curtain wall facades, vertically-oriented setbacks, and expressed floorplates. AHBE Landscape Architects is designing the project’s open spaces along the parking podium and at street level, as well as each of the tower’s rooftop amenity deck areas. The complex will contain 5,000 square feet of retail functions along the ground level organized along a public shopping plaza fronting Figueroa Street. When compared with previous iterations of the project, the plaza space appears to have been enlarged and deepened, with less LED screen coverage than previously designed. The plaza’s central area will be dotted with trees that extend along the sidewalk in paired sets. According to Urbanize.LA, the first phase of the multi-phase project will construct the hotel tower, with the residential component following after an existing hotel structure on the site is cleared. The complex will add to the ever-growing set of construction cranes in the area. Construction crews are currently wrapping up work on the Harley Ellis Devereaux-designed Circa Towers located nearby and partway through construction on the Oceanwide Center complex by Gensler. A final timeline for the L.A. City Center project has not been announced. To take a walk down Downtown Los Angeles's Figueroa Corridor these days is to behold a sea of construction cranes. The entire area is currently being transformed by rising crop of transit-accessible high-rise luxury towers. One of the biggest changes coming to the area will be the recently-proposed Figueroa Centre tower project by architects Callison RTKL. The designers recently revealed a second rendering for their new 66-story tower which, if completed according to plan, will become not only the third-tallest structure in Los Angeles, but also the tallest residential building in the region. The project is slated for 200 condominium units, 220 hotel rooms, and 94,000 square feet of retail spaces. The new tower—it will be located at 925 S. Figueroa Street and rise 975 feet—is part of the large-scale effort to make Los Angeles a better draw for large-scale trade and professional conventions by boosting the overall supply of rental housing and hotel rooms in the areas surrounding the Los Angeles Convention Center and L.A. Live complexes. The city is currently planning to add 8,000 new hotel rooms to those areas, a boom that over the next few years will add a new wing to Downtown Los Angeles’s fledgling skyline. For the most part, the new towers are being built above existing surface parking lots. Up until recently, the city’s downtown skyline was made up mostly of high-rise office towers built in the late 1980s and early 1990s. Over the next ten or so years, however, roughly 20 new towers are due to sprout along Figueroa Street alone, from the foot of L.A.’s newest, tallest tower—the 1,018-foot-tall, A.C. Martin-designed Wilshire Grand Hotel—to the southernmost flank of Interstate-10. Several of those projects are already well under construction, including the Callison RTKL-designed Oceanwide Plaza complex, a $1 billion project consisting of a trio of towers rising between 40- and 49-stories in height. The podium levels of that project are quickly rising out of the ground. Ultimately, the project will contain 150,000 square feet of shopping areas, 504 condominium units, and a 184-key hotel. The twin, 36-story tall Circa towers by Harley Ellis Devereaux are nearly topped-out, according to a time-lapse camera perched over the site. Crews at the Circa site have been snapping curtain wall elements into place over the last few weeks, while crews at the Metropolis project have finished one of that project’s four towers are and are making quick work of the remaining three. A timeline for the Figueroa Centre project has not been announced.